Hannah Kempf (left) is one of two Miami University students named 2017 Goldwater Scholars. 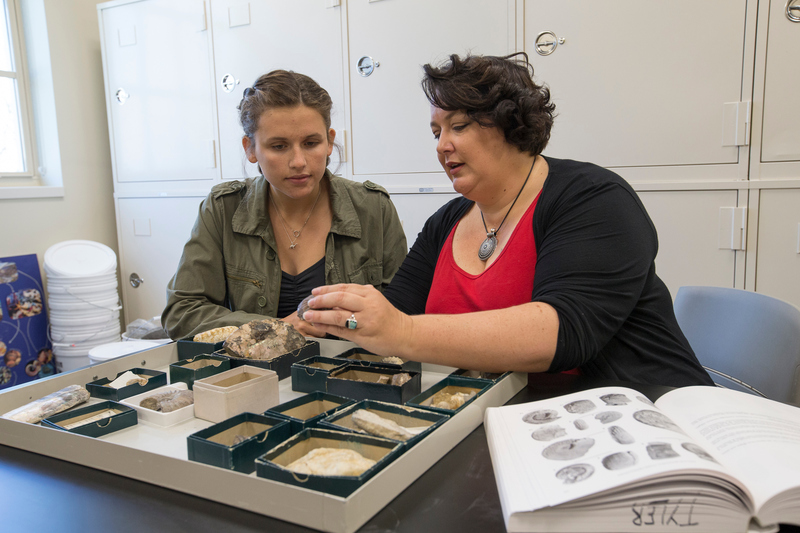 The geology major is mentored by assistant professor of geology and environmental earth science Carrie Tyler (right). Two Miami University students have each received a Goldwater Scholarship for 2017-2018. They are among 240 students nationwide to receive the scholarship, the premier undergraduate award of its type in the fields of mathematics, natural science and engineering. Jana Cable, a junior microbiology major from Bowling Green. Hannah Kempf, a junior geology major and Spanish minor from Indianapolis, Indiana. Avnika Bali, a junior biochemistry and biological physics double major and mathematics and neuroscience double minor from Oxford. Max Leveridge, a second-year environmental earth sciences major with environmental science and sustainability co-majors from Dublin. The Goldwater Foundation Scholarship Program encourages outstanding students to pursue careers in the fields of mathematics, natural sciences and engineering. Nationwide, faculty nominated 1,286 students for the one- and two-year scholarships, worth up to $7,500 per year. Cable and Kempf are two of eight students at an Ohio public university to receive a Goldwater Scholarship. Bali and Leveridge are two of six students at an Ohio public university to receive an Honorable Mention. Read profiles of Miami’s Goldwater Scholars and honorable mentions online. Urayama, a 1993 Goldwater Scholar from the University of California-Irvine, was recently profiled on the Goldwater Scholars website. Read his profile online. Written by Susan Meikle, Miami University News and Communications. Originally appeared as a “Top Story” on Miami University’s News and Events website. Photos of Jana Cable and mentor Natosha Finley and Hannah Kempf and mentor Carrie Tyler by Jeff Sabo, Miami University Photo Services. This entry was posted in OARS news and events, Uncategorized, Undergraduate research and tagged Goldwater Scholars, undergraduate research. Bookmark the permalink.